The old banner put up by Friends of the East River Esplanade was stolen last month, the group says, after it was installed. HARLEM — A local conservancy group has re-installed a new banner Tuesday after the previous one was stolen last month — and they're installing extra security to ward off a repeat theft. Friends of the East River Esplanade installed a 60-foot-long, 7-foot-tall banner worth $2,000 on 116th Street and FDR Drive at the end of June, but it was snagged by thieves days later. Jennifer Ratner, a member of the conservancy group, said the new banner, which has the same design as the old banner, was installed with “dozens of galvanized steel ties” and grommets installed every 18 inches across the banner, along with additional security measures. She declined to disclose those additional measures as to not embolden copycat thieves. 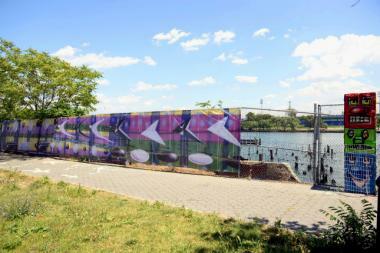 The kaleidoscopic banner, designed by famed artist Kenny Scharf, was installed in an effort to beautify the waterfront and drum up interest in the area. An adjacent cartoon-themed brick column, which was not stolen, was also designed by Scharf. Ratner told DNAinfo New York previously the artist tied the stolen banner to the chain-link with double-stranded steel bailing wire — which is “much stronger that plastic zip ties,” she said — and snipped excess wire to secure it to the fence and make it difficult to untie. She said at the time the thieves must have used professional tools to take the banner down. The group filed a police report with the 25th Precinct in Harlem last month. No suspects have been caught. The banner is expected to remain up until the end of September and the brick column is slated to remain until June 2017.